I take a short trip up to the glacier to bid farewell. 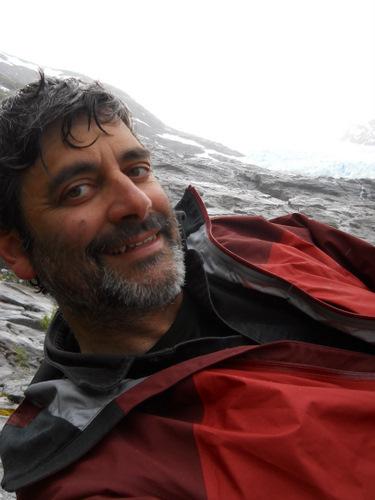 I am very grateful for the experience all the folks at Polartrec have given me, especially Kristin and Janet, who are wonderful Alaskan hosts!. Thanks to Robbie and Roy from Polar Services for their support and equipment.. Thank you to Miriam Jackson and Hallgeir Elvehoey for helping me in the tunnel and for getting around Norway! Thank you Denis for teaching me about your research on acoustics of rock cracking and the great ideas you gave me....Many thanks to Professor Neal Iverson for arranging to have me join his glacier group, many thanks to Pete Moore for his support of teachers and trusted advice on geology, many thanks to Ben for making the geology lessons easy and cribbage difficult, and to Knut for bringing in his research and enthusiasm from Penn State. A really big thank you to Mark Mathison for taking care of all the details and making me feel part of the group, I am very thankful for his expertise and I am sure his students in Iowa are eager to have him as a teacher. And finally a big thank you to the National Science foundation for support of teachers and students across the USA. I hope they continue to fund valuable programs like this. Bye from the Svartisen glacier near the Arctic Circle in Norway! Today I am off to Bodo. 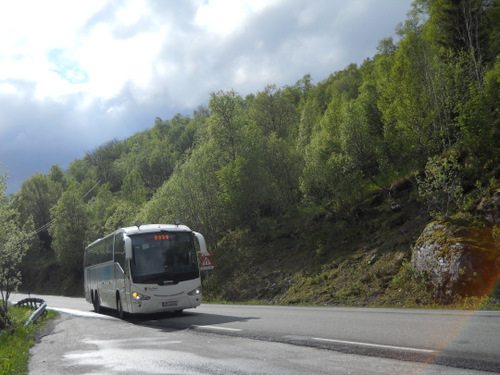 It is a short trip across the fjord on a ferry, then by bus for about three hours north to Bodo. I will stay at the same hotel when I arrived and then catch a morning flight to Oslo. 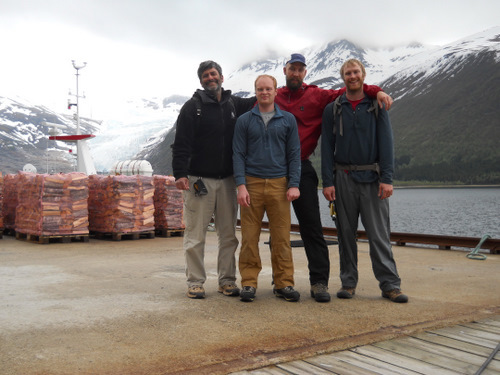 At the dock, waiting for the ferry, Knut, Pete and Ben bid me farewell. I feel a bit sorry for these guys because they still have to hike up the glacier and enter the tunnel again. A once in a lifetime opportunity that makes you really appreciate the abundance of life. 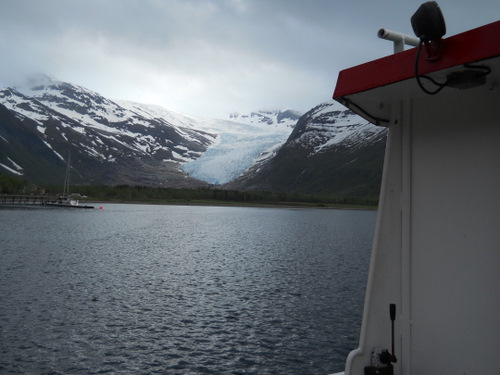 My last view of the glacier from the ferry looking back. I just sit by the side of the road with my backpack and satellite phone and wait. The bus arrives right on time, I have a three hour ride ahead of me North to Bodo. 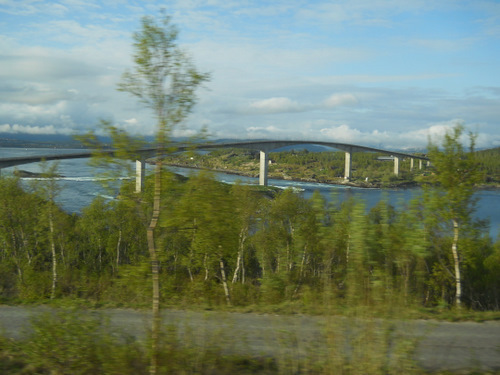 The road back to Bodo crosses the Saltstraumen that Mark brought me to about a month ago. It is nice to see familiar sights again. 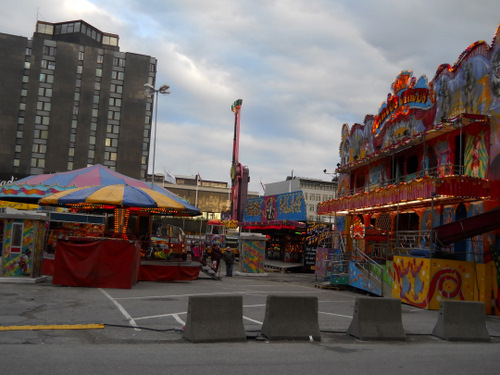 Bodo has not changed much, but there is a carnival going on when I arrive. It is late in the evening and it is still daylight. I grab some food at the local market and head off to sleep. Tomorrow I head to Oregon.